Triphala is one of the most versatile herbal formulations that is made from powder of three different fruits. This gives it its name: “tri” which means three and “phala” which means fruit. It can also be called triphala churcha where the name churcha means powder. It is a staple for Ayurveda medicine. Triphala has a combination of three acids i.e. Gallic, ellagic and chebulinic. These three are all strong antioxidants. Triphala also has anti-inflammatory, antibacterial and antidiarrheal abilities due the presence of flavonoids and polyphenols. The three fruits that are combined to make triphala have their own benefits which make triphala a pack of health benefits. The three fruits are amla, haritaki and bibhitaki. The powder from these three fruits are mixed in three equal parts to make triphala. Amla– this fruit is high in vitamin C and can be used individually or in combination with other plants to treat common cold. It can also be used as a liver tonic, anti-inflammatory agent, laxative, digestive and diuretic agent. Haritaki– this treats a variety of health issues such as diabetes, dementia and constipation. Bibhitaki– it is used in the treatment of high blood pressure, rheumatism, and diabetes. Triphala has the ability to suppress the growth and spread of cancer cells. This is according to a study that was done in 2015 to establish the antiproliferative and proapoptotic effect of triphala on colon cancer. It was found out that triphala not only stops the spread but also induces cell death of human colon cancer. The gallic acid that is present in triphala has also shown positive effects to anticancer activity especially in the case of prostate cancer cells. A study that was done in 2014 also showed that triphala mouth rinse can be used to reverse tobacco-induced oral precancerous lesions. Generally, triphala is a promising anticancer drug. Colon cleanser, natural laxative and possible colitis helper effects. Triphala can be used to naturally clean the colon. Cleansing the colon is important for removing bacteria, eliminate excess fatty acids and heavy metal detox. A colon cleanse also has a positive effect on the nervous system it helps relieve the symptoms of fatigue and anxiety. Amla helps in intestinal repair, haritaki plays the role of strengthening the intestinal muscles and bibhitaki pulls off old mucus from the colon walls. As a natural laxative, triphala tend to be gentle than any other OTC laxatives. It nourishes the digestive system and aids in regular bowel movement. The heavy amount of flavonoids as well as antioxidant activity in triphala makes it have a considerable effect on reducing colitis. The fact that triphala helps in regular bowel movement makes it help in weight management and obesity. Triphala plays a great role in proper digestion that helps to eliminate fatty acids from the body. It also promotes healthy eating habits by giving the body a combination of natural tastes. It promotes the absorption and assimilation of healthy nutrients keeping the body well balanced. Cholesterol naturally occurs in the body and it is made by the liver. It is required for proper cell functioning in the body as well as the nerves and hormones. This means cholesterol is good for the body but in a healthy amount. When it is too high, it poses health risks such as formation of plaques that slow down blood flow in the arteries. Triphala plays a great role in reducing cholesterol levels as well as arterial plaques. A study that was published in the journal of the pharmaceutical society of japan showed a significant effect of triphala on cholesterol levels. Bibhitaki also inhibits the progression of atherosclerosis plaque. Using triphala will also help in blood circulation. It increases the cardio movements in the capillaries. The flavonoids are also strengthened for blood circulation. The high content of antioxidant and polyphenol in triphala makes it good for anti-inflammatory effects. Arthritis is the inflammation of joints which causes pain and stiffness. Consuming triphala can be one of the natural ways to fight arthritis. It helps to improve bone cartilage breakdown for rheumatoid arthritis. Triphala plays a great role in both external and internal inflammation that can be due to poor immunity or lack of nutrients in the body. Triphala is rich in strong antibacterial and antimicrobial properties. These are ideal for body cleansing to get rid of unwanted bacteria in the body. It also helps in healing bacterial infection in the body. This will help especially in healing wounds faster. The antibacterial properties also help in metabolism. It eases the digestive system reducing chances of constipation and indigestion. Triphala has a property that plays the role of blood purification in the body. It purifies and cleanses blood of all toxins. The liver and lungs also benefit from this as well. Triphala plays a great role in eliminating disease such as jaundice and bronchitis. Triphala Benefits for Rejuvenating the Skin. 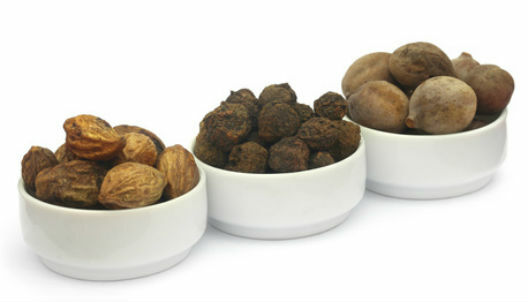 The presence of antioxidant compounds in triphala help to clear pigmentation and also kill bacteria that cause acne(1). Oil that is made from triphala helps to soothe dry and flaky skin. It rejuvenates, moisturizes and smoothens the skin. Generally, triphala is an overall healthy herb. It has so much to offer in terms of health. Some of the other benefits include: improved eyesight, nurtures voice quality, strengthen hair roots and color, and much more. Triphala can be found in form of powder which can be mixed with lukewarm water and taken before bed. It can also be mixed with honey and lemon juice. For capsules, they should be taken three times a day. Triphala can also be taken in form of tea. Triphala also has side effects. It is therefore important to be aware of the rules for this herbal mixture. Pregnant women should avoid using it as it can cause miscarriage. Diabetics should also try and avoid it and should only take it under medical supervision. It can also lead to bloating and intestinal gas. A high dose leads to diarrhea. For those taking it as a laxative beware of dehydration, muscle weakness and dizziness. If any of these occur, discontinue the use of triphala. As with all medicinal herbs always consult a herbalist or health care professional before using the herbs.